Produkte: FORMOSUS GRAECUS - Sicher zum Graecum! ANCIENT GREEK texts contain the basic thoughts of western philosophy, culture, and religion. So it is always worthwile to read these texts in their original form! 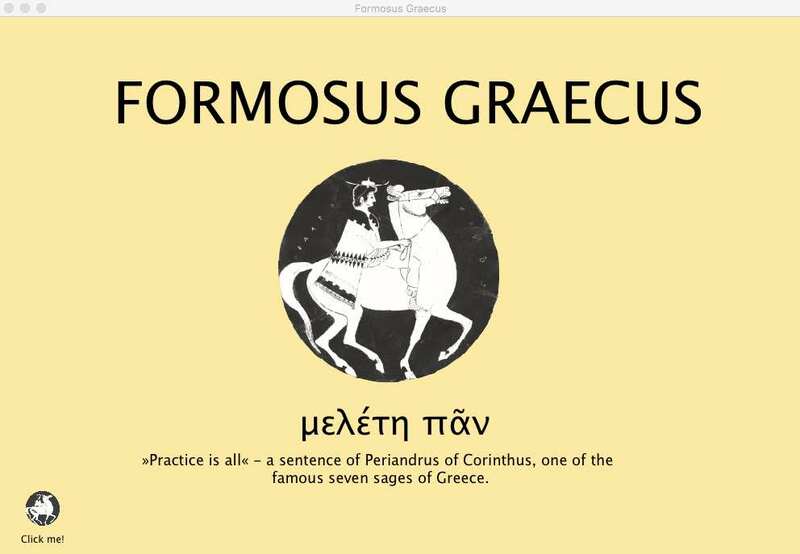 FORMOSUS GRAECUS helps you to learn quickly and thoroughly Ancient Greek words and forms in order to open your mind for thinking about the content of the Greek texts. FORMOSUS GRAECUS contains a lexicon with more than 5500 entries. Based on this lexicon, there exist already vocabularies for use, one with the basic words of Greek texts, another with the words used by certain authors or those found in special types of texts, e.g. Homer, epic texts, poetry, historiography, Thucydides ... New Testament. Besides this, there is the vocabulary of the "Basics of Biblical Greek" (with the friendly permission of the author Dr. William D. Mounce). Based on the lexicon, it is very easy to enter the vocabulary of your own textbook into the program. Hover the mouse over the words that you have to learn and see the meanings together with the word. Check what you have learned by clicking only the words that you do not remember surely. Let FORMOSUS ask you the words (see figure) and simultaneously learn the principal forms of the words. Print flash cards of the words of this list. FORMOSUS GRAECUS is able to build every form of every word of its lexicon. For beginners, FORMOSUS GRAECUS can be adjusted to the user's learning level by the lesson numbers if the morphological progress of the textbook is entered in the program. The facility for entering correctly the grammatical content of the lessons is included. FORMOSUS GRAECUS presents forms of every level, selected at random, to the user who has to identify the word (entering the lexical form) and the form (by clicks on the coloured buttons). The programm doesn't work with lists of presumably difficult forms! There are several levels for help: from describing the grammatical features of a word, to indicating the misclicked buttons, to the direct presentation of the solution. Naturally, the meaning is asked too, (but in this part of the program one correct letter is sufficient). Here, the user has to build a given form of a given word. When he confirms his entry with the return key, FORMOSUS GRAECUS checks it and marks the correct parts with red colour. Here too the user is supported in different ways to find the parts and to compose the complete form. If the user doesn't find the solution, the form is saved in the mistakes list, which can be used later for special practice. The bar graph recording the results gives feedback. Building chains of forms requires much concentration, but will result in great language ability too. 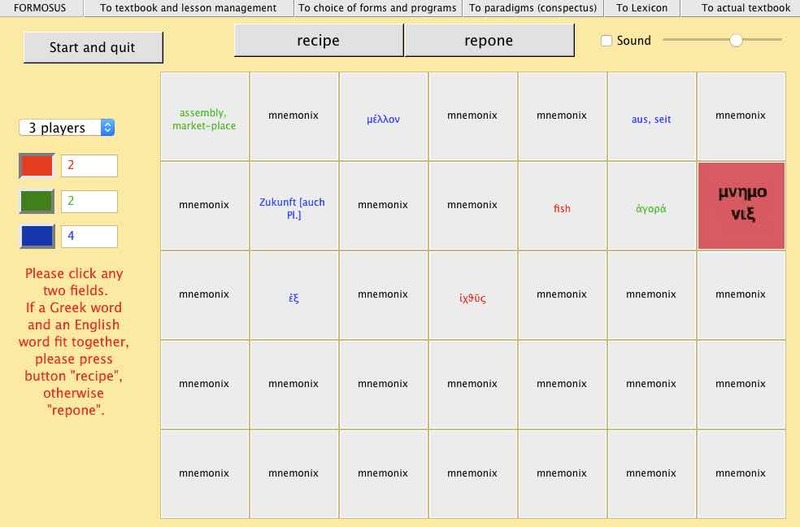 According to the selection, you can practice whole paradigms or single forms in all tenses or moods, etc., both in conventional order or at random. Here too FORMOSUS GRAECUS examines each entry and marks the correct parts. There is a special selection for practicing principal forms. A time measurment makes it possible to have a contest between different users. It is very important while reading Ancient Greek texts to recognize the basic form of a word by which it is found in a dictionary. The method to find the lexical form that is used in schools, is emulated in this part of FORMOSUS GRAECUS, esp. see letter b! a) Testing a form: FORMOSUS GRAECUS allows you to test your suppositions about a word. Write a word in the pink field, define the supposed form with the coloured buttons and press "RUN". Then compare the result with your text. b) Parsing a form: Enter a form of your text or of Identifying forms that you don't recognize into the light blue field. Press "RUN". Then separate the written form by using blanks into the supposed parts and press the return key. Repeat the same procedure until FORMOSUS GRAECUS gives you a result. Test this result by the method described in a). Teachers can create a batch of 10 forms for building or identifying and print it in different sizes (up to 8 tests on 1 sheet): The daily practice for your students with very little expenditure of time and labor! FORMOSUS GRAECUS contains tables of all Greek forms to look up and compare. You can use FORMOSUS GRAECUS - within the limits of its lexicon - as a normal dictionary. Moreover you can search for strings within a word. FORMOSUS GRAECUS 2017 requires Unicode compatibility for polytonic Greek. Older versions contain an own Ancient Greek Textfont. 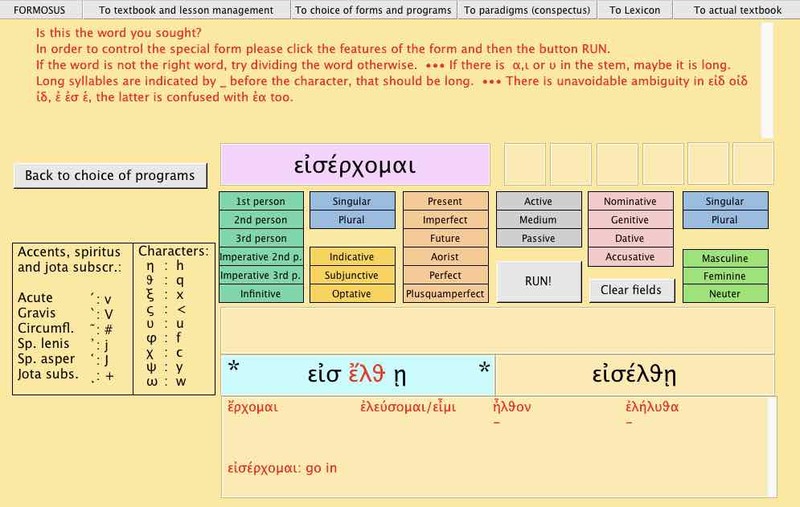 There is an help panel for writing Greek on each page where it is required. "Sounds great." (First reaction of an English speaking person in response to a short description of FORMOSUS GRAECUS). VALID LICENSE DATA IS REQUIRED in order to use all features!